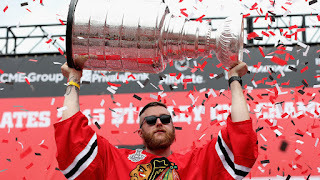 Stan Bowman and the Chicago Blackhawks said goodbye to Lemont, IL native, and Stanley Cup Champion goaltender, Scott Darling today as they traded him to the Carolina Hurricanes for a 3rd round draft pick in the upcoming draft in June. Darling was to be a unrestricted free agent as of July 1st. Bowman found a suitor for Darling, who finished tied for 5th in the league in save percentage (.924). With the Blackhawks backed up against the salary cap yet again, Bowman did the only thing he could do, get something in return for him. Darling should easily earn a multi-year salary averaging between $3-$4 million per year. With the 3rd round pick in return, the Blackhawks now have 10 draft picks in the upcoming draft (one pick in the 1st-4th, and 7th rounds, three 5th rd, and two 6th rd picks). 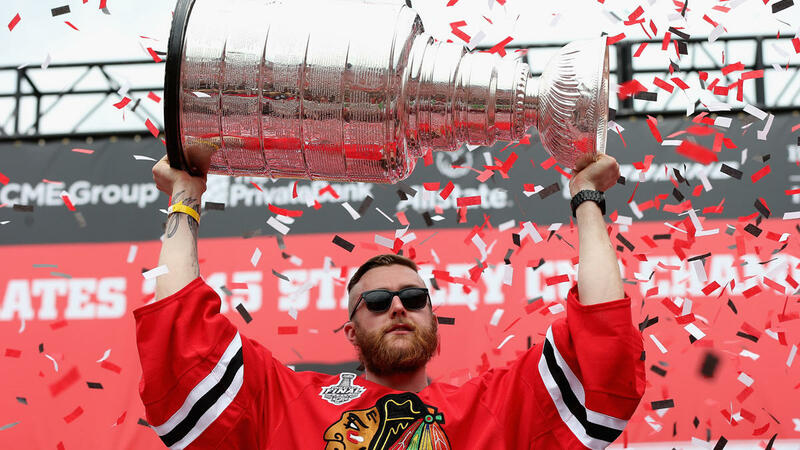 Darling came to the Blackhawks as a journeyman goalie who fulfilled a kids dream of playing for his hometown team and winning the Stanley Cup in 2015. Over 3 years with the Blackhawks, Darling compiled a record of 39-17-9, 2.37 GAA, .924 SV%, 4 SO. He and Corey Crawford combined to with the Jennings Trophy in 2015 for least goals allowed. As to who will be back up for Crawford next year, that is yet to be seen as Mac Carruth and Lars Johansson are also set to become unrestricted free agents. Bowman has started the off-season moves already. With ten picks in this year's draft, don't be surprised to see at least one or more of these picks, possibly packaged with a veteran, for some young talent. 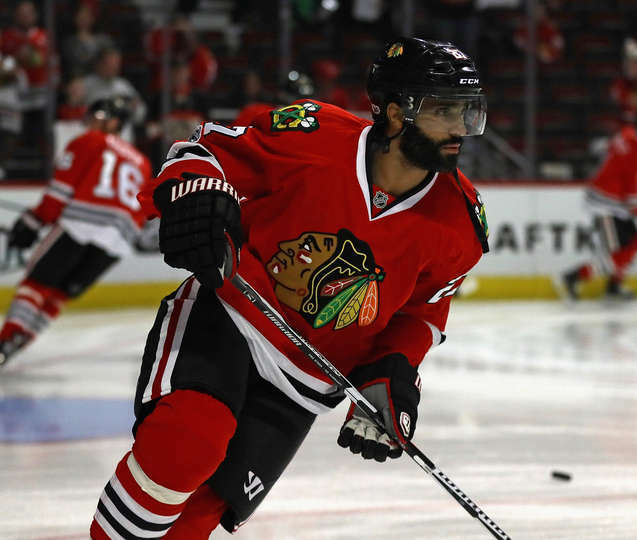 Blackhawks' Bowman Shaking The Tree, But What About The Roster? 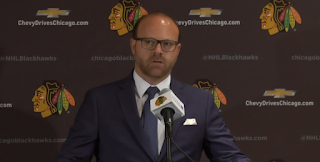 Chicago Blackhawks General Manager, Stan Bowman stated things were going to change, after their embarrassing 4-game sweep dismissal from the playoffs at the hands of the Nashville Predators. It started by firing Assistant Coach, Mike Kitchen yesterday. Kitchen had been with the Blackhawks since the 2010-11 season and was part of the '13 an '15 championship teams. Honestly, it makes sense since the Hawks' penalty kill has been horrible the last two seasons, including one of the most brutal starts in NHL history this past season where they gave up 14 goals in the first 26 attempts. Head Coach, Joel Quenneville was not happy with the dismissal of Kitchen. Kitchen was Quenneville's assistant while Q was the head coach of the St. Louis Blues back in 1998-99. That lasted 6 years until Kitchen came to the Blackhawks after the 2010 season. Next, Bowman went further into the Blackhawks system and relieved Rockford Icehogs Head Coach Ted Dent from his duties today. Dent, had been part of the Blackhawks minor league system dating back to the 2006-07 season when he was an Assistant Coach with the then AHL affiliate, Norfolk Admirals. Dent and the Icehogs had a horrible year (25-39-12) and missed the playoffs for the fist time in six years under Dent's reign. That is fine that Bowman has shaken the tree, but he needs to shake the roster. He said to not be surprised if some of the core players are not here next year. The problem with this? Any player with a substantial cap hit, (Toews, Kane, Keith, Seabrook, Hossa, Crawford) have No Move Clauses (NMC)s in their contracts. This means that if Bowman was to trade one of these highly priced players, they would have to agree to waive their no trade clause to make it happen. The most logical candidate to leave if he agrees to waive his NMC, would be Brent Seabrook. His cap hit is $6.875mil for the next seven seasons. He scored just 3 goals, the lowest in his 12 year career. This coming a year after his contract year in which he scored a career high 14 goals. Can Bowman swing a deal for a 5th/6th, young, D-man, and possibly a 2nd rd pick? Who knows, but one thing was blatantly obvious in these playoffs. The Blackhawks defense is slow, and getting older. Seabrook, unless he was injured, was not moving well. They gave up 31.4 shots per game this season. The last time they gave up that many shots? 1988-89 season. Bowman is now being tested hard for the first time since the break-up of the 2010 Stanley Cup team. What he does here will be looked at a lot more closely this time around. Two exits in the first round of the playoffs, when you are expected to go deep, will do that to a person. The motto is 'One Goal', not 'One Series'. Let's see what magic Bowman has left in his wand to turns this team around. How The Predators Swept The Blackhawks. What's Next For Chicago? 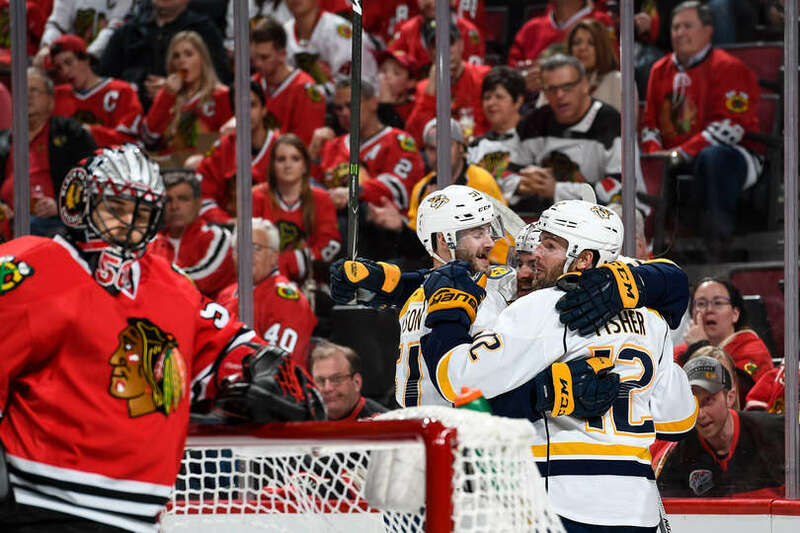 The Chicago Blackhawks found themselves packing their bags for the summer as the Nashville Predators swept the Blackhawks with a 4-1 victory. For the Predators, the fourth time is a charm. After being eliminated by the Blackhawks in 2010, 2013, and 2015, they had something to prove. Boy did they show it. They outplayed the Blackhawks in almost every aspect. To win the Cup, you need bounces and breaks to go your way. The Blackhawks found themselves on the wrong side of almost every bounce. That is not taking anything away from a Predators team that dominated this entire series. Pekka Rinne was solid in net, although was not tested often in the series. Amazingly, Rinne, in the series, had as many points as any of the Blackhawks (2 assists in Game 2). Board battles, faceoffs, net presence, all were dictated by the Predators in this series. Another glaring problem was the slowness of the Blackhawks in the series, particularly their defense. 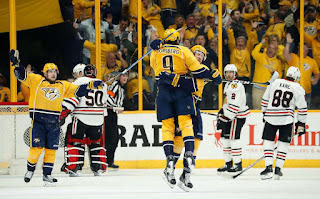 The Predators outscored the Blackhawks in the series, 13-3. Big questions now arise for the Blackhawks. Two first-round exits in the last two seasons now for this franchise. More disturbing, in the last two post seasons, Jonathan Toews has scored 1 goal (11 games). Patrick Kane, two goals. What does this mean for this team that will have to deal with yet another season of salary cap questions. Do players become expendable now to be traded for younger talent? Brent Seabrook, who did not have a good year, has a $6.8mil cap hit for the next seven years. Marcus Kruger, who has a $3mil cap hit for the next two seasons would be a reasonable choice to leave. Stan Bowman would have rather thought about these problems two months from now, but instead, he'll have a couple of months to think of a way to turn this franchise around. 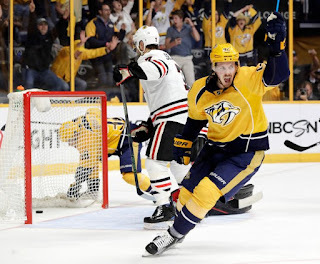 The Nashville Predators took a commanding 3-0 lead in the best of seven series against the Chicago Blackhawks with a 3-2 come from behind victory from the stick of Kevin Fiala, 16:44 into OT. The Blackhawks took a 2-0 lead heading into the 3rd period. Their first goals and lead of the series. Dennis Rasmussen solved Pekka Rinne (34 saves) with a stuff shot in front of the net from a pass from Marcus Kruger. Later in the period, Patrick Kane scored his first of the playoffs on the power play to give the Hawks a 2-0 lead. Then, in the 3rd, a Viktor Arvidsson shot took a weird bounce off the glass behind Corey Crawford, (46 saves), and dropped in front of the net where Filip Forsberg tapped it in to cut the lead to 2-1. Then, a controversial goaltender interference, which was later called a good goal, tied the game at 2 with just under 6 minutes left in regulation when Forsberg again scored after Arvidsson brushed Crawford while trying to make a save. In the overtime, the Predators had the better end of play as the Blackhawks started to look slow and tired. It cost them when an arrant drop pass from Marian Hossa was picked up by Nashville and led to the winning goal by Fiala who patiently waited till he had Crawford alone and down, and stuffed it into the back of the net. The Blackhawks again were horrible at the faceoff dot winning just 42% of the draws. Marcus Kruger and Artem Anisimov combined for just 9 wins while losing 29. A horrible 24%. The Predators look to close the series out Thursday night in Nashville. 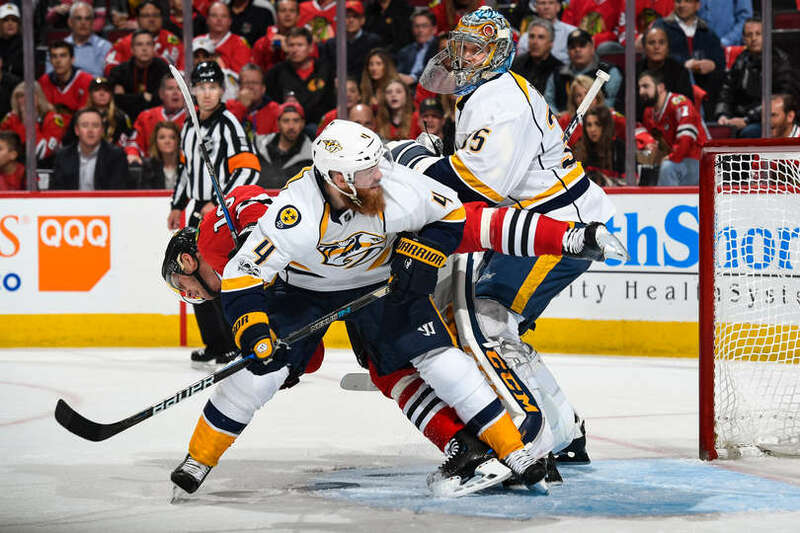 Pekka Rinne recorded his second consecutive shutout as he and the Nashville Predators dominated the Chicago Blackhawks, 5-0 at the United Center to grab a 2-0 series lead in this best of seven series. Not only did Rinne dominate in net stopping all 30 shots he faced, he added two assists in the game and has more points than Patrick Kane and Jonathan Toews have goals in their last 8 playoff games combined. It took just 3:44 into the game for the Predators to find the back of the net as Ryan Ellis sent a slapshot from the point that Corey Crawford did not see as Viktor Arvidsson screened him in front of the net. That is something that the Blackhawks have yet to do this series. The Predators dominated play on the boards, won puck battles, and faceoffs. the fourth line for the Predators continued to give the Blackhawks fits as Harry Zolniercyzk scored on a partial breakaway in the second period to extend the lead. 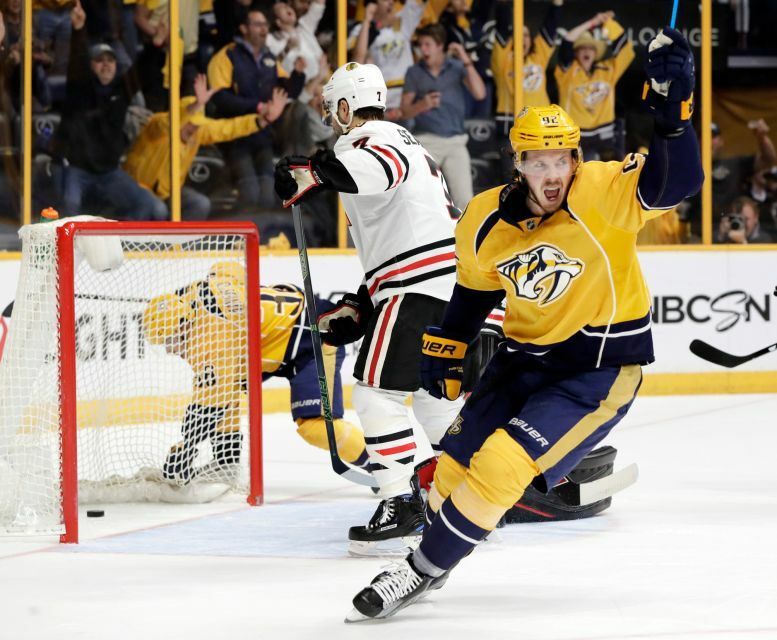 Blackhawks head coach, Joel Quenneville juggled lines constantly once again in order to find a connection that could solve the Predators defense. The more he did this, the more the Blackhawks seemed out of sync. Missed passes, blown coverages, slow line changes. The Predators kept the game fast paced as the Blackhawks were chasing pucks after a while. The Blackhawks had a hard time penetrating the Predators blue line as they constantly clogged up the neutral zone with four defenders. When they did enter the zone, the Hawks had no chance to set up as the Preds constantly applied pressure. 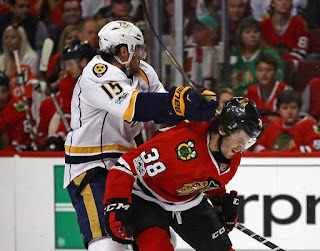 Frustration kicked in at the end of the game when Ryan Hartman took a senseless penalty that gave him a roughing penalty along with a misconduct penalty as he checked Craig Smith in the head after he already knocked him to the ground. To add insult to injury, as the score was already 4-0, Kevin Fiala capitalized on the power play to end the scoring, to make it 5-0. The series is still a long way away from being over, but the Blackhawks have dug themselves deep. They have a lot to do in order to get out. This team has done it before, but can they do it again? Game One between the Chicago Blackhawks and the Nashville Predators was a defensive battle as the Predators stole home ice advantage from the Blackhawks with a 1-0 victory. Nashville goalie, Pekka Rinne stated he looked forward to getting the chance to play the Blackhawks again, who had bounced he and the Predators twice in the first round the previous two times these two teams met ('10, '15). Rinne proved that by being the star of the game as he stopped all 29 shots he faced. 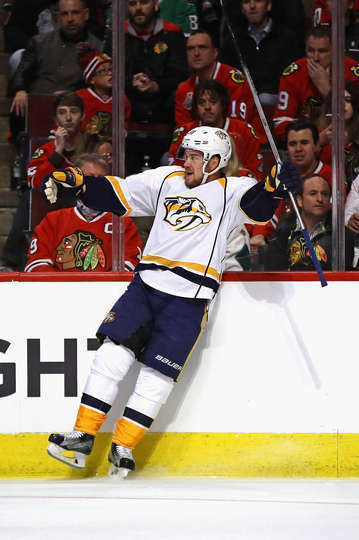 Viktor Arvidsson scored the lone goal in the first period on a nice redirect near the front of the net. Corey Crawford stopped 19 shots in the loss. The Blackhawks did not play poorly, but they did have poor shot selection as for when they did get shots off, no one was in front of the net to screen Rinne. The Predators had 26 blocked shots. The Blackhawks need to find better lanes and be smarter with the puck. They had good puck possession, but not good shots or net presence. 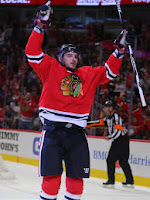 Artem Anisimov returned for his first game since an injury side-lined him for the last three weeks of the regular season. He looked good, and did have good net presence, which resulted in some good chances. He was the only person in front of the Predator net to create those scoring chances. Notable Mentions: It's the first time the Blackhawks have been shutout at home in the playoffs since the 2012 playoffs. 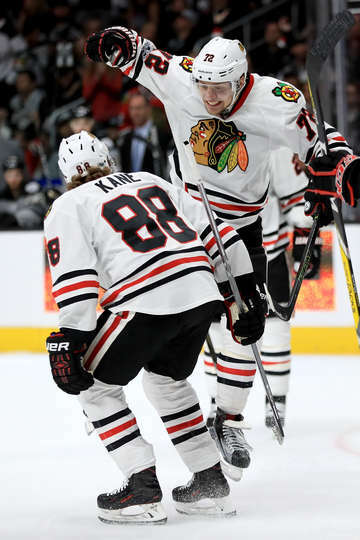 Dating back to last year's playoffs, Jonathan Toews and Patrick Kane have combined for one goal. That is not the "One Goal" Blackhawks fans or management were thinking when stating that phrase. 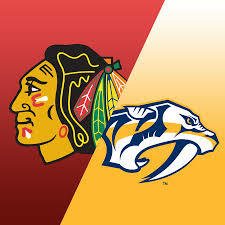 The Chicago Blackhawks and the Nashville Predators face off for the third time in the last eight years as their playoff series start tomorrow night in Chicago. The Blackhawks won the regular season series, three games to one. Due to the NHL scheduling this year, all four games were played by January 8th. Both teams have gone through changes since they last met. Specifically for the Blackhawks, their penalty kill. They started the season with an historically horrible PK. The Predators were a big reason for that as they went 5-for-9 on the power play in their first two games against one another. The Hawks fixed their PK for the second half of the season and finished 24th overall for the season. That is saying something considering as of October 26th, they had killed just 12 of 26 power play attempts. So what should we look for this series? 1 - Hot players - In their last 30 games Patrick Kane has 40 pts., Artemi Panarin 30 pts., and Jonathan Toews 30 pts. Last season, the St. Louis Blues held Kane and Toews to a combined one goal in a 7-game, 1st series loss. They will have something to prove. 2 - Net Presence - Artem Anisimov returns to the lineup and will provide a big body in front of Predators goaltender, Pekka Rinne. If they are going to win this series, Anisimov, Tanner Kero, and Richard Panik, will have to be a screen against Rinne. Also, others like Ryan Hartman, and Jonathan Toews, will need to crash the net for rebounds. Playoffs are full of ugly goals. This series will be no different. 3 - Faceoffs - The Blackhawks were ranked 29th in faceoff winning percentage (47.5). Unless Toews plans on taking every faceoff (54.9), someone will have to step up their game. If you win the faceoff, you win the puck, the other team can't score. Especially if the draw is in your zone. 4 - Shots Against - The Blackhawks averaged 31.4 shots against this year. Not since the 1988-89 season, have the Blackhawks given up so many shots against on average for a season. That has to stop. That gives too many chances to the opposition. You play with fire. Which leads me to #5. 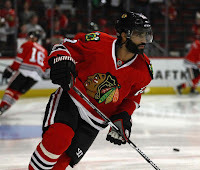 5 - Defense - The addition of Johnny Oduya at the trade deadline was probably the biggest move the Blackhawks could have made to make a run for the Cup. Being able to have a foursome of him, Duncan Keith, Brent Seabrook, and Niklas Hjalmarsson, will be huge. Not to mention having Brian Campbell available to log long minutes should help the Blackhawks tremendously. 6 - Goaltending - The last line of defense. Corey Crawford and Scott Darling have seen a ton of rubber thrown at them this year and they combined for a .918 SV%. Good for 6th in the league. Crawford will get the nod again this post season and try to bring home a 3rd Stanley Cup. This won't be an easy task for the Blackhawks, but they should will win this series, 4-2. Artemi Panarin cashed in for the second year in a row as he finished in the top ten of all forwards in the scoring title, earning him a hefty $1.725 million bonus. The last goal, in the last game of the season, secured Panarin to receive his bonus which will put the Chicago Blackhawks in yet, another familiar problem with its biggest opponent every year, the salary cap. 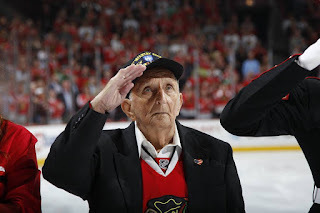 But the Blackhawks have to be given credit for letting this happen. After securing the Western Conference with four games remaining in the regular season, Coach Joel Quenneville began to rest key players, Jonathan Toews, Corey Crawford, Niklas Hjalmarsson, Duncan Keith, Marian Hossa, and Johnny Oduya. Knowing Panarin had the opportunity to cash in on this hefty bonus, and knowing that it will cause General Manager Stan Bowman headaches with the salary cap, Panarin played each of those four games and scored three valuable goals. The Blackhawks could have easily have rested he and Patrick Kane, who both played every one of the 82 games, but they didn't. Panarin was given a two year extension earlier in the year giving him a healthy raise from his $875,000 salary to a $6 million salary. The Blackhawks surely would have liked to have given him a long term contract, but with the salary cap issues to struggle with, both sides agreed on the two year extension. With the trust of Panarin willing to take a two year extension from the Blackhawks, and the trust of the Blackhawks to allow Panarin the chance to earn his bonus, both sides have built a very strong relationship so far to date. Panarin has to be very pumped to have gotten his bonus, which can only help the Blackhawks as they begin their run for the Stanley Cup. Not that Panarin wasn't tearing up the league already by scoring seven goals in his last seven games. NHL's President's Trophy - Does It Really Reveal The Best Team? Trophies are great, fun, allows bragging rights. In the NHL, there is the Holy Grail, a.k.a. the Stanley Cup. The NHL presents many other trophies as well. One of which, is the President's Trophy. It came into existence during the 1985-86 season. Decided by the NHL Board of Governors, they wanted to recognize the team with the best record in the NHL. It's an achievement that any team would be proud of. Though I believe the fans enjoy that bragging right more so than the players do. It hasn't really been the guide to the best team in the league either. Of it's 30 years in existence, 8 teams have won both the President's trophy and the Stanley Cup in the same season, only twice in the last 9 years. 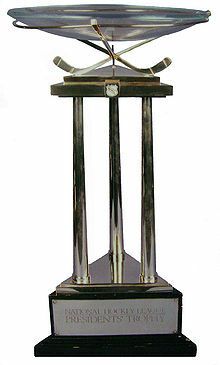 In the 2005-06 season, the Detroit Red Wings compiled 124 points (58-16-8) and won the President's Trophy by 11 points. Keep in mind, this is before shootouts. They lost in the first round of the playoffs that year to the Edmonton Oilers who had a total of 95 points (41-28-13). Some have referred to the President's Trophy as to being 'honored' to be on the cover of Sports Illustrated or the cover of an EA Sports Madden game. In other words, 'the kiss of death'. Regardless, the President's Trophy is nothing to thumb one's nose at. An 82 game season is grueling on players and it truly is an accomplishment to be proud of. But we all know that is not the trophy these players bleed and sweat over every year. It is the Stanley Cup. It is one of the hardest prizes to capture. Just ask the New York Rangers - 53 years, and the Chicago Blackhawks - 49 years, before they were able to taste from the Cup. Or, you can ask current teams like the Toronto Maple Leafs - 48 years, St. Louis Blues - 45 years, and 11 other teams that have been waiting 15 years or more. The NHL did right in creating this trophy. An NHL season is arguably the hardest season to go through among the four major sports (MLB, NFL, NBA, NHL). Teams and fans should be proud of what they accomplish. But take it with a grain of salt come playoff time. Stanley Cup Playoffs are like no other........and they are coming soon.